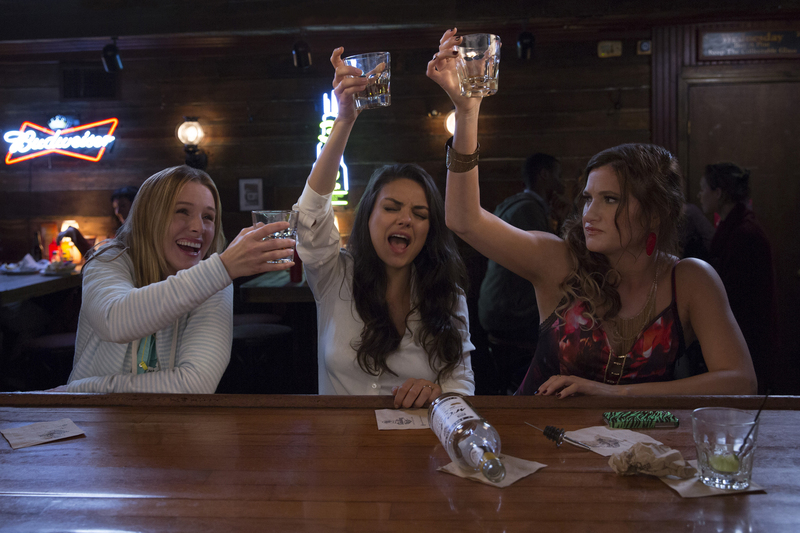 (l-r) Kristen Bell, Mila Kunis and Kathryn Hahn star in BAD MOMS. ©STX Productions. CR: Michele K. Short. HOLLYWOOD—Mila Kunis arrived in the U.S. from Russia as a refugee along with her family when she was only seven years old. Though her parents were educated and had respectable jobs, they saw no future for their children in their bigoted home country and left with little more than the clothes on their back. America, a nation of immigrants, welcomed them with open arms, and though it is not without its flaws, Kunis’ adopted homeland has inspired her to work hard to achieve the American Dream. She began taking acting classes just two years after she arrived and soon landed guest roles on TV shows. As a teen, she played likable high school student Jackie on Fox’s “That ‘70s Show.” She subsequently has enjoyed a productive film career, starring opposite Natalie Portman’s dark rival in thriller “Black Swan,” Mark Wahlberg’s exasperated girlfriend in Seth MacFarlane comedy “Ted” and the conflicted witch in Disney’s “Oz The Great and Powerful,” among others. The 32-year-old actress, who is married to her former TV show’s co-star Ashton Kutcher in real life, is mother to 21-month-old toddler Wyatt, and has another bun in the oven (though her condition isn’t visibly obvious during an interview). The Ukraine-born actress now stars in the raunchy comedy “Bad Moms,” in which she plays a hard-working mother of two, who gets fed up trying to be perfect and decides to take a walk on the wild side with some of her fellow flawed moms. She co-stars alongside Christina Applegate (who plays her judgmental PTA nemesis), Kathryn Hahn, Kristen Bell, Annie Mumolo and Jada Pinkett Smith. In a candid interview, Kunis spoke about motherhood, playing a mom and meeting her political idol, U.S. Presidential candidate Hillary Clinton. Kunis: I think that when it’s referred to as “bad mom,” it’s not moms that put their kids’ lives in danger. To clarify it’s not, “I’m a bad mom. I forgot I had a child.” It’s not that dramatic. It’s just being able to allow yourself to make mistakes and know that it’s OK to ask for help and not put so much pressure on yourself. I think that that’s what it refers to when it when is says “bad mom” It’s just the antithesis of the perfection that society puts and the pressure we put on ourselves. Q: On a scale of 1-10, how would you rate yourself as a mom? Q: What’s the best advice you received from your mom that you want to pass along to your kids? Kunis: My mom was never big on advice. She’s one of those people that said, “Learn from my actions, not from my words.” My whole life she’s never been like, “Let me tell you how to live your life.” She would live her life in a really beautiful way and hopefully I would emulate it. My mom’s great. She’s just not one of those people who would ever tell someone else, “Let me tell you how to do it.” She’s just not that type of person. She’s just always been a wonderful, giving human being. She’s always come over and she always just helps out. I don’t know how else to say it but it’s never through words, it’s always through actions. 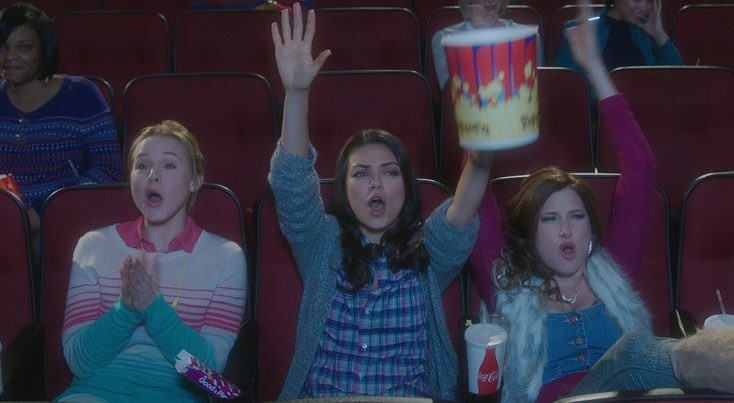 Q: Were you surprised when you discovered that “Bad Moms” was written by two men (Jon Lucas and Scott Moore, who also directed it)? Kunis: A little bit. Honestly, I’ve got to tell you when I read it the first time around I didn’t realize, or I didn’t pay attention to who wrote it. Then at the very end I was like, “Huh.” It had something written, “To our wives” and I was like, “To our wives?” Then I flipped the front of it and I was like, “Oh, no ****. It was written by two guys.” It kind of oddly did make sense. It was written very much like an homage, like a love letter to their wives and so it does make sense. Q: Could you talk about some of the things that you brought to your character—who’s basically the straight character in this kooky group of women—that you either thought were funny or made it more authentic? Ultimately, every line was re-worked a little bit to just make it seem natural, versus making it seem like a memorized piece of dialogue. As far as content went, it’s 100 percent them. Certain jokes—I mean Kathryn’s so funny in it, naturally funny—were hers, some were Jon’s. Q: Has being a mom changed you as an actor? And how so? Kunis: For me it changed everything. I mean it changed me as an actor but I think it gave me a really interesting sense of confidence, in the same way that you’re saying. I think my priorities shifted. My priorities shifted a while ago, but my priorities really shifted when I decided to start a family, and I think I became incredibly selfless. Knowing that I was going to have a baby made me be like, I know that I have to give up so much of myself and I’m happy to do that. It wasn’t like, “Oh, I’ll sacrifice.” It was more like, “Oh no, I want to do this.” I think having these types of emotions and having gone through this, ultimately you see characters in a different way and you can sympathize with characters in a different matter. That being said, aside from the selfish issue of it, it also makes you pick projects differently, because is this worth me going out of town for? Is this worth me being away from my child? In my 20s, I had nothing to lose. I was traveling the world, working non-stop and I was like, “Life is great”, because I really didn’t have a home to come back to, in a good way. I was young and 20. Then all of a sudden I had a husband and a child and I was like, “This is not worth it. I want to be home with my family.” Then I started looking at projects in a very different manner. Q: Has Ashton seen “Bad Moms” yet and, if so, what was his reaction? Kunis: He did see it. He loved it, genuinely loved it and if he didn’t, I would lie to you and tell you that he hadn’t seen it, so he loved it, which was great. Q: What did you and your co-stars talk about when you weren’t working? Kunis: Everything, literally. There was never quiet on the set, I’ll tell you that much. Q: You’ve been recently quoted as taking issue with the anti-immigrant stuff that’s been happening in the U.S. Anything you want to say about where we’re at as a nation? Kunis: Who cares what I have to say? The truth is I will give my opinion when in a conversation form, but in reality, no one should listen to anything I say. Educate yourself. Educate yourself on what it is that you find to be interesting. Go with three things that mean the most to you and educate yourself on it. Go with platforms. Know what people stand for, know what’s wrong and form your own opinion. What I have to say is based on what I find to be important and given that I’m an immigrant, that I came here on a refugee-based visa yeah, I have a very different opinion as to what’s happening in the world today, but that’s from my experience. So, to me, there’s certain things, women’s rights is important to me, gay rights was important to me. Now we finally are past that point. Whenever I did vote for presidents, whenever there was an election, whenever there was a point made, I always say there’s so much for people to consume information wise, just pick three issues that are the most important to you. Educate yourself on those three issues and who do you align yourself with, and that’s it. That’s all you need to worry about. Everything else is just loud noise. I can go on and on. I’m a massive political junkie. I just recently had the privilege of talking to Hillary Clinton. There’s nothing I can say. We’ll see what happens. Q: Sen. Clinton is now a grandmother and you’re a new mother and a soon-to-be mom for the second time. Did you talk about your kids? Kunis: With Hillary? No, we didn’t. No, no, no, no. We talked about politics. We actually have a couple people that we know that used to be in her office that are acquaintances of ours. We briefly talked about having children, but no, mostly it was about politics. Q: What do you think of her now that you’ve met and talked with her? Kunis: She’s really smart. At the end of the day I think people discredit her level of intelligence and everything else is just loud noise and it doesn’t matter, She’s so brilliant. Here’s what I will say about her: The most brilliant people I’ve ever met, I go to conferences all the time. I go to Yellowstone (Club, a tech conference in Montana) and I’m very privileged that I get to be a part of these amazing groups. The most brilliant people that I’ve ever had the luxury to talk to have always been in her cabinet. The one thing I can always say is I know whether she’s smart or not, she hired really, really smart people and lets them do their job.